Rajiva Wijesinha, MA, DPhil (Oxon) (born May 16, 1954) is a Sri Lanka writer in English, distinguished for his political analysis as well as creative and critical work. An academic by profession for much of his working career, he was most recently Senior Professor of Languages at the University of Sabaragamuwa, Sri Lanka. In June 2007 President Mahinda Rajapakse appointed him Secretary-General of the Sri Lankan Government Secretariat for Coordinating the Peace Process – SCOPP (http://www.peaceinsrilanka.lk), and in June 2008 he also became concurrently the Secretary to the Ministry of Disaster Management and Human Rights. The Peace Secretariat wound up in July 2009, and in February 2010 he resigned from the Ministry as well as the University, as he was a candidate on the National List of the United People’s Freedom Alliance in the General Election held on 8 April 2010, following which he was appointed a Member of Parliament. Early in 2011 he was appointed Adviser on Reconciliation to the President, and has revived the former Peace Secretariat website, beginning with a series of articles entitled ‘The Road to Reconciliation’ which deals with resettlement and the reintegration of former combatants. He used a considerable proportion of his decentralized budget to sponsor programmes for these last in collaboration with the Commissioner General of Rehabilitation, including training in counselling and entrepreneurship development. He belongs to the Liberal Party of Sri Lanka (http://www.liberalparty-srilanka.org/), and has served as its President and Leader, and also as a Vice-President of Liberal International. He is currently Chair of the Council of Asian Liberals and Democrats. He has travelled widely, including as a Visiting Professor on the Semester at Sea Programme of the University of Pittsburgh, and has published Beyond the First Circle: Travels in the Second and Third Worlds. Rajiva Wijesinha schooled at S Thomas’ College, Mt Lavinia, and won an Open Exhibition in Classics to University College, Oxford when he was 16. After his first degree, which also led to an MA in 1977, he moved to Corpus Christi College, Oxford as E K Chambers Student (Edmund Kerchever Chambers), and obtained a BPhil. degree in English, followed by a PhD in 1979 on the subject of Women and Marriage in the early Victorian novel. The thesis was subsequently published by the University Press of America under the title The Androgynous Trollope. He taught briefly at the University of Peradeniya before resigning in protest against the increasing authoritarianism of the government of President Junius Richard Jayewardene. He then worked for the British Council in Colombo as its Cultural Affairs Officer before rejoining the University system to initiate English degree programmes for students from backgrounds that had limited English in school. He was responsible for the islandwide pre-University General English Language Training programme, as well as General English programmes at the Affiliated University Colleges established in 1992 to introduce employment oriented courses into the tertiary education system. In 2001 he served as a Consultant to the Ministry of Education to initiate the reintroduction of English medium education in the state sector, which had banned it previously for several decades. He was also Academic Consultant to the Sri Lanka Military Academy when it began degree programmes for Officer Cadets. He has served as chair of the Academic Affairs Committee of the National Institute of Education, and has been a member of the National Education Commission and of the Board of the Bandaranaike Centre for International Studies. In 1982 he supported Chanaka Amaratunga to set up the Council for Liberal Democracy and was Co-Editor of the Liberal Review, at a time when dissenting voices had no space to publish in Sri Lanka. He took over as Leader of the Party after Dr Amaratunga’s death in 1996, and was its Presidential candidate in 1999, and came 6th out of 15 candidates, defeating several former parliamentarians. During this period he conducted workshops on Liberalism in India, Pakistan, Nepal, Afghanistan and Indonesia, on behalf of the Friedrich Naumann Stiftung (FNS), the German Liberal Foundation, for which he edited Liberal Values for South Asia (revised recently as Liberal Perspectives on South Asia and published in 2009 by Cambridge University Press, Delhi). He was instrumental in promoting English Language writing in Sri Lanka, and initiated the English Writers Cooperative of Sri Lanka while at the British Council. He had earlier edited the New Lankan Review, which provided space for Sri Lankan writers in English when the genre was regaining acceptance. He has edited several collections of poetry and short stories by Sri Lankan writers in English, most recently Bridging Connections, an Anthology of Stories which also contains translations from Sinhala and Tamil and was published by the National Book Trust of India in 2007. A companion volume of poetry will appear later this year. He was the first Sri Lankan writer resident in the county whose works were translated into a European language. Servi, the Italian translation of Servants which won the Gratiaen Award for 1995, was published by Giovanni Tranchida Editore in Milan in 2002 , and this was followed in 2006 by Atti di fede. This last was a translation of Acts of Faith, based on the 1983 government-sponsored riots against Tamils known as Black July, and the first part of a trilogy that included Days of Despair (1989) and The Limits of Love (2005). He worked on this last novel, which is based on the kidnapping and murder of the poet and journalist Richard de Zoysa, as a resident at the Rockefeller Foundation’s Bellagio Center and at the Center for Writers at Hawthornden Castle. Prof Wijesinha serves at present on the editorial board of the Journal of Commonwealth Literature. Works in other genres include The Foundations of Modern Society, Political Principles and their Practice in Sri Lanka and A Handbook of English Grammar, published by Cambridge University Press in Delhi, which also brought out most recently Declining Sri Lanka: J R Jayewardene and the erosion of Democracy. 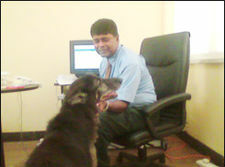 Given the range of writing that has been covered in his main blog, he has now started a new blog to cover creative writing and criticism as well as reminiscences (www.rajiva2lakmahalcolombo.wordpress.com). This will also include extracts from previous publications such as ‘Beyond the First Circle: Travel in the Second and Third Worlds’.